Next summer, Child's Play will be back on the big screen in the form of a remake. From MGM's Orion Pictures, the film will have no connection to the still-running original franchise, rebooting the story from the start. With this change comes the renaming of the Good Guy dolls from the original movie, which are now going to be called Buddi dolls. To help promote the movie, MGM has created an official website, letting people pre-order their own Buddi doll. To do this, all it takes is entering in your email address, and the website will then display the film's poster with an "expected delivery date" of Jun. 21, 2019. Of course, this isn't a legitimate pre-order for an actual doll based on the Buddi dolls from the movie. The fine print at the bottom of the page notes that this is strictly for promotional purposes, and that the dolls are not actually on sale. By entering your email address, you will then be kept up to date on Child's Play, leading up to its actual release date. That's obviously going to be on Jun. 21 of next year, which is the same date the faux order lists your Buddi doll as expected to deliver. Although fake, the website does look real enough to feel slightly immersive when typing in your email address, and is at least good for a chuckle. Still, there's undoubtedly going to be some people out there disappointed that they can't actually order the doll. 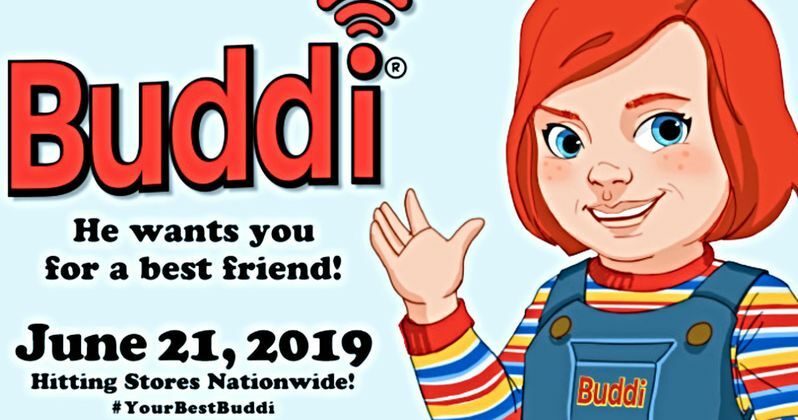 A letter from President and Founder of the Kaslan Corporation, Henry Kaslan, is also included on the viral site, offering fans a tease of what they can expect out of the technological marvel that is the Buddi doll. "A message from Henry Kaslan: Hello, friends! At Kaslan, we believe that happiness is about more than just entertainment. It's about being known. Understood. Loved. It is our global mission to continue to create innovative and interactive products designed not only to educate and entertain, but to spread friendship across each and every household in the form of technological interconnectivity. We at Kaslan take great pride in our unwavering focus to revolutionize technology in ways that positively impact the lives of friends across the world. And this, my friends, is our proudest moment. We've taken all of our research and learnings and applied them to create not only the most high-tech and interactive toy on the market, but a companion to be enjoyed by the whole family. Every child is important to us, and every child deserves a best friend, so we at Kaslan made it our top priority to build one. It is with immense enthusiasm and pride that I introduce to you our most cutting edge, technologically advanced Kaslan product to date. Introducing your new best friend, Buddi. Available for pre-order now, Buddi will be joining housholds across the world starting June 21, 2019. Thank you, friends! Henry Kaslan, President and Founder, Kaslan Corporation." As mentioned, the new Child's Play has no relation to any previously-made film in the series. This has left some horror fans unhappy, as the feeling is a remake isn't necessary if the film franchise is still going on. After all, the most recent film in the series, Cult of Chucky, was released just last year. Chucky creator and director of the past several films Don Mancini has also announced his plans to continue the story in a new TV series. Regardless, MGM has fast-tracked this remake, and we'll be seeing the franchise back on the big screen in just a matter of months. Fortunately, the feeling from MGM is that there's enough room in this world for both iterations of the story, and Mancini still has the freedom to pursue his planned continuation. In the original film, Chucky came to be after serial killer Charles Lee Ray used black magic to transfer his soul into a Good Guy doll's body. He then targets a young boy named Andy intending to do the same thing, so he can be reborn as a human. The new film will be taking more of a technological approach to the story, with the mechanical Buddi doll becoming homicidal due to problems with its A.I. programming. Reportedly, the doll will still be using the name Chucky, although voice actor Brad Dourif will not be lending his voice to the role. Written by Tyler Burton Smith, the new Child's Play comes from director Lars Klevberg. Aubrey Plaza, Gabriel Bateman, and Brian Tyree Henry will be starring, taking over the original film roles from Catherine Hicks, Alex Vincent, and Chris Sarandon, respectively. You can catch the movie when it premieres on Jun. 21, 2019. To "pre-order" a Buddi doll, you can head on over to BestBuddi.com.